So I was having trouble sleeping last night and while my mind was going and going and going while my body begged it to stop running I had the funniest thought (or maybe it's only funny at 1am). If the kind of shoes a guy wears say a lot about him.... those kicks need to speak up because i'm not hearing much. But really.... so what? Other than giving you some hint at the overall dress style (or lack of) what do a guys shoes really say about him? and laid back. And yet another site said this dude has no respect for himself or you. -Polished expensive loafers = trendy, stylish, uptight, wealthy, traditional. Also, TOOL. - Alligator loafers (i guess that means leather with a square toe?) run away, treat man like an actual alligator... mm k? 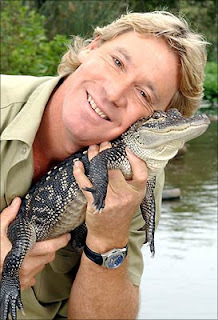 I guess that's the type of guy for Steve Irwin. - One site hailed flip flops as the catch all shoe but I absolutely disagree! Hairy toes anyone? Nah. - Designer prada loafers; this man supposedly collects women like he collects name brand objects. Good thing I wouldn't know these shoes if I saw them. 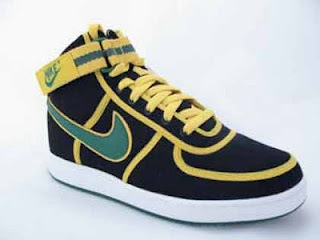 -Colorful trendy tennies= clean, well put together, takes pride in his appearance... and player! So.... what of it? I don't care a whole lot. I mean, I DO actually notice a guys shoes. And I like when I like them. But it isn't something that changes the overall attractiveness of the individual or tells me what kind of person they are aside from how they act. I'm probably not into the guy in designer alligator skin loafers... or cowboy boots. I don't mind ratty sneakers. They say comfort, practicality and thriftiness to me. But when it comes down to it... who cares? I like guys and a guy caring that much about how his shoes look is a bit feminine. And please, don't shave your toes if you choose to wear flip flops.